How Do We Know the Biblical Sites are Authentic? Today we are visiting Bethlehem so it is a good time to discuss the authenticity of the Holy Sites. 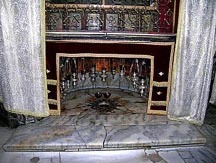 People always ask me: how do we know these are the real sites where Jesus and Mary lived and walked? It is a fair question, especially if people have paid a lot of money to visit these holy sites. The earliest Christians realized the importance of these sites and immediately marked them as sites to be remembered and venerated. Small memorials were built, or places to pray and pilgrims came from around the world to remember these spots and to worship God and to pray. In 135 ad Emperor Hadrian—in an attempt to wipe out Christianity and to obliterate the memory of the holy sites—tore down all the Christian shrines and built pagan temples in their place. Ironically, when he set out to destroy the holy sites, he actually marked them for future generations. . . .
For the rest of the article with lots of pictures, click here. Medias have always something to say against the Catholic Church.